Unsightly birthmarks, spider veins on the face and legs, age spots, sun spots, freckles, and unsightly excess hair affect millions of people. While these may not be medical problems, many of our patients would like to be rid of these unattractive distractions to their natural beauty. 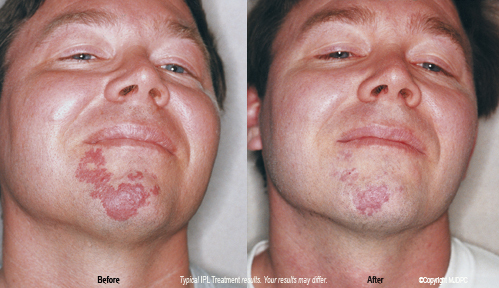 Advanced IPL treatments are performed by our doctor for patients in our region to safely, easily, and effectively treat many benign pigmented and vascular skin lesions painlessly on an out-patient basis. IPL treatments are performed with a non-invasive medical system that uses intense pulsed light therapy to reduce melanin, the dark pigment in your skin. The light energy is gently delivered to your skin in pulses, through a delicate, computer-controlled handpiece. After your IPL treatment, the treated vein, lesion or hair will gradually fade and slowly disappear. 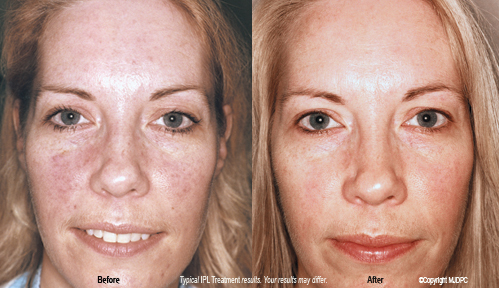 After our physician performs IPL treatments, most patients will see improvement in their vascular and pigmented lesions. The improvement can be quite dramatic. However, as with any medical procedure, there is always a possibility that only minor changes will occur and in rare cases there is no response.